We are on the road as I’m writing this post and recently attended the G3 Conference as the start of our trek south for the next few weeks. It is a full two and a half days of teaching and truly my mind and body are exhausted but it gives my husband and me much to discuss over the next couple weeks we have together on the road. We’ve used this time to head south to not just be a time of relaxation, (although it is) but as a time to reevaluate our goals and priorities individually and together as a couple who love the Lord. Doug still works while we’re south and I work on catching up on blogging, business items and reading too. The conference had sixteen main sessions and many breakout sessions. The focus of the G3 Conference is theology (G3 stands for Gospel, Grace & Glory). Every year it is a different area of theology and with this year's being called – The Mission of God: A Biblical Understanding of Missions most of the topics were focused on the local church and how they select and send missionaries. All the sessions were of great value even for lay people so if you have time to listen to them all please do. The two that had the most impact on me were Tim Challies and the Question and Answer session. (I’ll direct link to these as soon as they’re up on the website to watch or listen in to). The app is a handy way to listen in. Tim Challies exposited Luke 5:1-11 and it was a great sermon on evangelism and encouraged me to engage and how to engage in this Christian discipline that we all are called to take part in as part of the great commission. In the Question & Answer session, the panel shared some ways to cultivate a heart of missions in your family and then shared some of their favorite missionary biographies. I wanted to pass this along to you and my blog becomes a resource for me too in remembering and implementing these areas of change in our family too. I probably use that search bar on the side panel more than anyone ;). Be intentional in your evangelism. Tim Challies mentioned that he decided that because he travels frequently and finds himself taking cabs or Uber rides frequently he would share about Jesus with every driver he had. Sharing the full gospel is always best if possible and time and hearts permit but at least determine to start a spiritual conversation, pray and see where the conversation leads. Leave a tract if possible too. You may not be traveling frequently but what areas of your day-to-day life can you be intentional in sharing the gospel with others. Pray regular for the missionaries your church supports. If they’re in town invite them to stay in your home or to have a meal with your family. There is not better to remember to pray for others than having a personal relationship with them and learning how to best pray for them. Missionaries are regular people like you and me who have been called to share the gospel in another land but they still have the same struggles we do and they need encouragement and pray as their lives may have them in some challenging life situations. Cultivate a heart for the lost world. There are some great resources online to help you pray for countries in the 10/40 window and just in areas where the gospel needs to be spread. Check out Operation World and The Joshua Project. The Joshua Project has a daily prayer guide and app available and Operation World is a great book to have in your library and they also have prayer resources online. Send cards, notes or emails to missionary families. Have your kids color pictures to send to them in a packet. Put a care packet together for them of some items they may miss from here in the states. Have a missionary or country of the week you pray for with your family. Learn more about the country and the pray through the needs of using a resource like Operation World. If your budget and time permits travel overseas to visit a missionary. We have done this over the years and visited missionaries in London, Germany, Poland, Mexico, and Africa. We loved being able to visit, encourage and take them to dinner and help in their ministries where needed. Truly, our time with them was more of an encouragement and blessing to us each time. In Africa, we participated in the teaching for a women’s conference and we’ve built relationships with them that have continued over the years. I love being able to pray for them and I also know they are praying for us too. Be intentional as a family and individual to the lost in your sphere of influence. Invite families over for dinner, schedule coffee dates with unsaved friends and continue to pray for opportunities to share the gospel with them and to do that you need to open your mouth. This is why we need to study the gospel and have a good and thorough understanding of it ourselves. Living Waters has some great free resources online for you to equip yourself to do this. Listening in to Wretched on Witness Wednesday's is encouraging too. 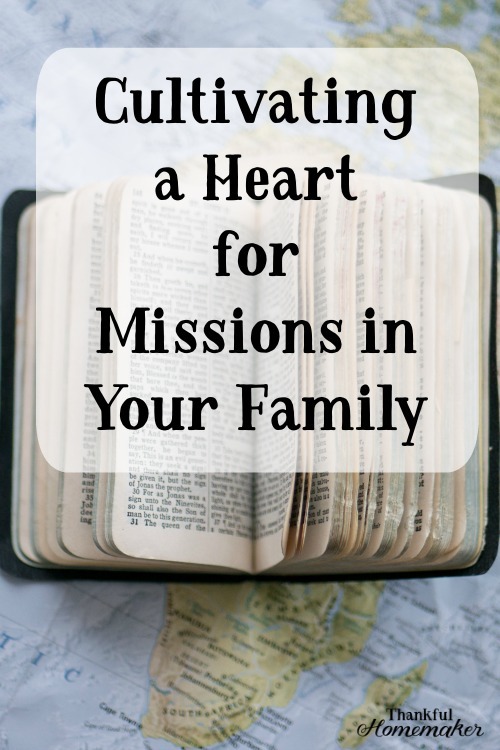 There are many more ways to cultivate a heart for missions in your family but these were the few that stood out to me and they are all pretty simple to implement. I want to share some of the biographies that the speakers recommended from that Question & Answer Panel. I also tossed in at the end a few of my favorites then I have read over the years. My favorite series for kids (and adults too!) are the Trailblazers Preachers and Teachers series. I’m currently reading the one on Martyn Lloyd Jones. I’m going to link to the conference messages as soon as they’re available and if you’d like notification you can sign-up for my email here. As soon as it’s online I”ll shoot an email with my favorite sessions. What am I missing? How do you cultivate a love for missions in your family? What changes can you make to be more intentional in this? What have been some of your favorite missionary reads?